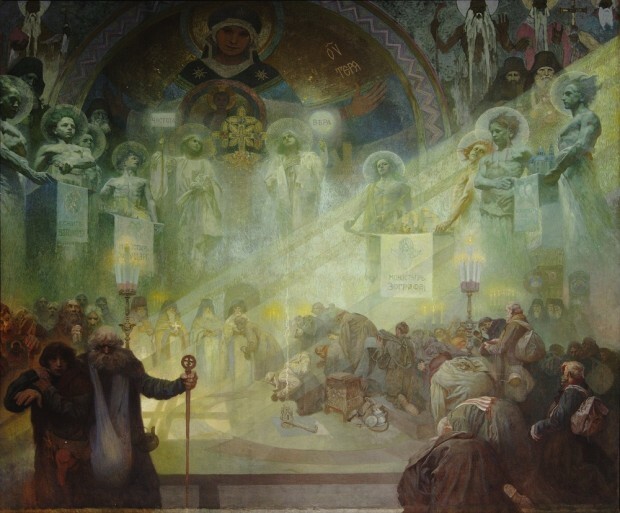 The 'Slav Epic' is one of the greatest works by Czech artist Alphonse Mucha. Over the course of 20 years, he painted 20 enormous canvases, some measuring over eight meters tall. If you're visiting Prague, there is no doubt you will come across Mucha's more commercial work. His style of art is quintessential "art nouveau" and features beautiful young women in flowing dresses surrounded by lush flowers. His tones for these commercial pieces keep the pale pastel colours we are used to seeing in typical art nouveau designs. But the 'Slav Epic' is something completely different. It is a must-see for those wanting to see another side of Mucha and explore the history of the Slavic people. 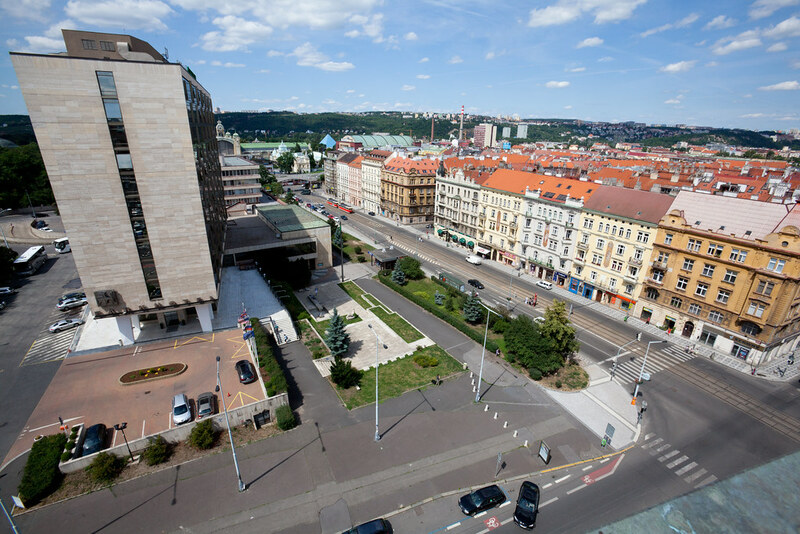 The 'Slav Epic' can now be seen in the National Gallery's Veletržní Palace, but will only be housed there until the end of 2016. The placement of these works has been a subject of considerable controversy over the years. Originally the canvases were exhibited in Moravský Krumlov and remained a precious treasure of the town for over 50 years. But Moravský Krumlov is located outside the city, which meant that few people visiting Prague had to opportunity to see the works. 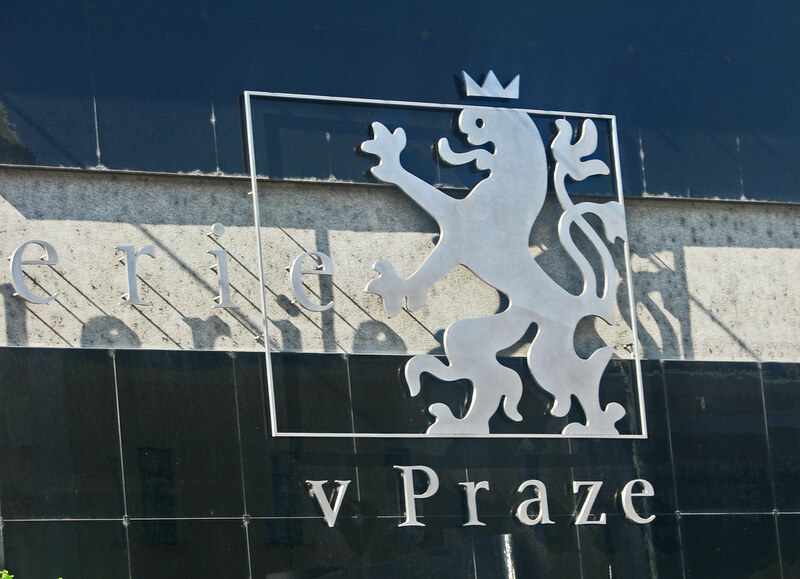 The city of Prague contested that the painting had been left to them and therefore shouldn't be displayed so far away. But in Prague, there was not a space suitable for showing all these incredible pieces. Thus they felt appropriately regal and important inside the old palace of Moravský Krumlov. In 2012, the city eventually won the rights to display the works temporarily in the National Gallery's Veletržní Palace for four years. After 2016, a new space will be ready to display the works in all their glory. When you step inside the work's gallery inside Prague's Veletržní Palace, you're immediately awestruck by the sheer size of these canvases. They feel more like walled frescos than average paintings. Moments are frozen in time, captured in life-sized (and in some cases, larger than life) works of art. 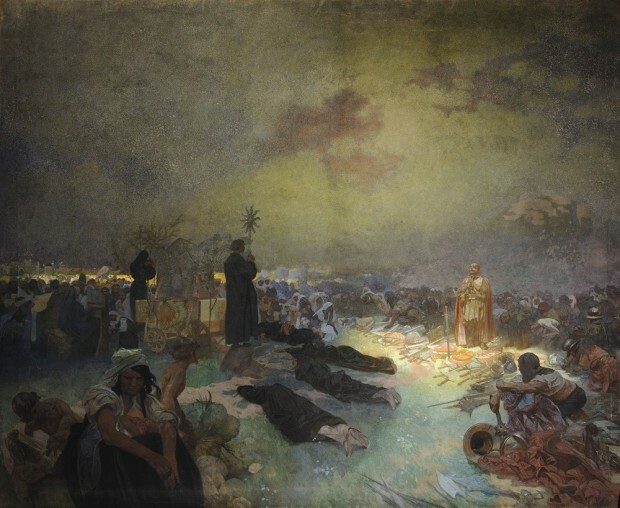 Each of the paintings depict the history of the Slav people, their civilization, wars, and celebrations. The first time you these works, after taking in their sheer size, is the quality of the canvas. These are not the languid, sensual forms of Mucha's other commercial art nouveau work. These are deftly painted portraits and landscapes that profoundly depict, in each stroke of paint, the emotions and collective journey of the subjects. The gallery gives you the option to purchase a small booklet which provides details about all the different works of art. I highly recommend doing this as the backstory and context of each part of the 'Slavic Epic' helps bring the paintings to life even more. Mucha first came up with the idea for the project when he was researching another assignment. While studying and travelling through the Balkans, he was truly struck by the hardships and sufferings of the Slav people. He also noted there was no real documentation of these stories in art. Mucha decided it would be his final task to bring these stories to life. Although he secured a financier for the giant undertaking, this was more of a passion project than a paid one. The long process of painting these enormous canvases took over 18 years to complete. During World War II, they were notably some of the first works of art hidden away from seizure by the Nazis. I'll give an overview of samples from the Epic and go over some of my favourite pieces. The series is chronological and starts with "The Slavs in Their Original Homeland," painted in 1912. In the 4th to 6th century, the Slavic people lived largely in areas of agriculture and marshes. Because there was no army to protect them, their lands were invaded time and time again. In this painting, you can see a couple hiding in the bushes as their village is burned to the ground. Their eyes are so vulnerable and seem to cry out to the viewer for help. In the top corner of the piece, you can see three figures floating. The largest of the figures, a priest, holds his hands outstretched. The two on either side of him represent war and peace. They are both a symbol of the wars to come for the Slavic people and the peace that will eventually befall them. The fifth painting in the series is entitled "King Přemysl Otakar II of Bohemia," painted 12 years after the first painting. 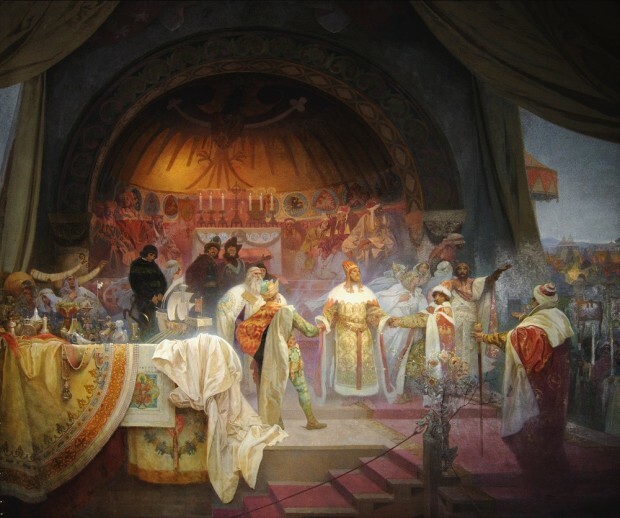 The piece depicts King Přemysl Otakar II, who ruled Bohemia from 1253-1278. The King is celebrating the marriage of his niece to the son of Hungary's King, therein forging alliances and strengthening both countries through the wedding. The King happily is greeting his guests inside an ornate tent covered in rich carpets and a beautiful mosaic dome in the background. This scene is lighthearted and full of hope for the countries' futures. The next painting in the series is the "The The Coronation of Serbian Tsar Štěpán Dušan." Dušan fought many successful wars, growing the size of the country and enriching the livelihood of his people in the process. In this scene, we see crowds of people and the procession of nobles in line for his coronation. Dušan is depicted at the centre of the frame. Walking in front of him are some young Serbian girls in traditional Czech attire, representing Mucha's faith that the children will follow in their leader's footsteps and bring freedom to the Czech people. After the happy and joyous scenes of these few canvases, we turn to a much sadder subject. The 11th piece is entitled "After the Battle of Vítkov." The scenes portray a priest performing mass for the fallen soldiers of the battle. The fight was between the Czech people and the then King of Hungary, Sigismund, brother of King Wenceslas. Sigismund was thought to be responsible for the death of the people's prophet, Jan Hus. After he died, the people refused to accept Sigismund as their king and marched against the Hungarian army, which occupied Prague Castle at the time. They surprised the Hussites and managed to overthrow the foreign army and took back the castle. The sun rising above the clouds beams down on a figure which represents Zižka, the leader of the Czech army. In the bottom of the frame, a mother is seen nursing her child while looking utterly overcome with pain, exhaustion and defeat. Although her army may have won the battle, many men had to die. She seems to know that there will be many more wars to come. The 17th piece is called "The Holy Mount Athos." Mucha believed that Mount Athos was a crucial place for the Slav people and is a vital, spiritual nest for the Czechs. 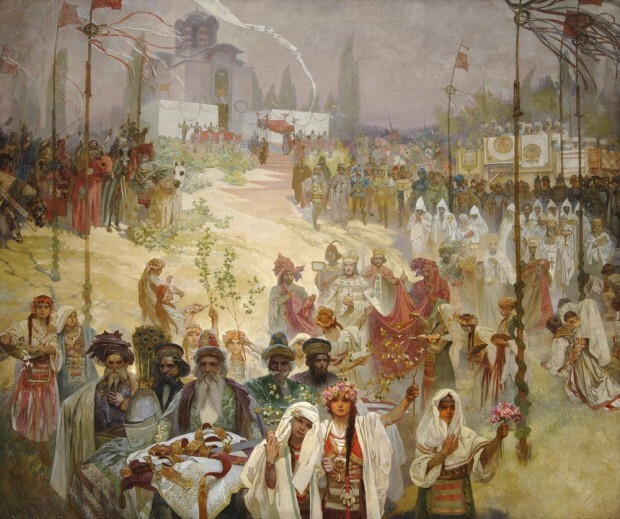 The painting depicts the Russians pilgrimage to the holy site. An ethereal green glow falls in through the windows, showering angels in light. Each of the angles holds in their hand a small model of Slavic monasteries that were built around the Mount Athos area, seemingly protecting and revering those little monasteries.. The final painting in the series is perhaps the most impressive, the colours within its frame is almost otherworldly. It's entitled "The Apotheosis of the Slavs, Slavs for Humanity." 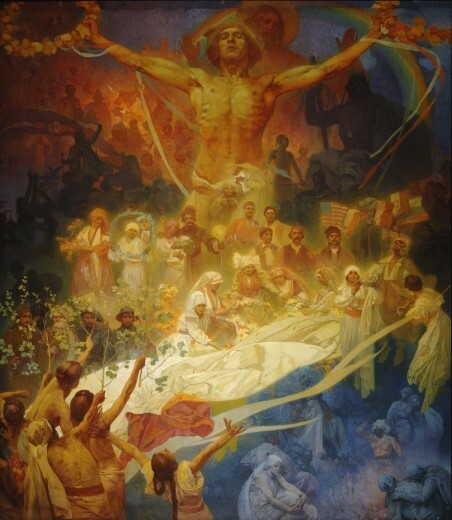 In this scene, Mucha sums ups all the themes that were explored through the preceding paintings. It celebrates the independence of the Slav nation in the 20th century. The painting is divided into four sections, each separated by colour. The blue portion in the bottom right represents the early years of agriculture and invasion. The red in the top right displays the brutal wars fought between the Hussites and the Czech army. The shadowed figures on either side of the painting represent the enemies of the Slavic people. The last group is the one marked with a bright yellow glowing light. In the centre, a man stands with his arms stretched out so wide they almost touch the edges of the canvas. He represents the new, independent Czech Republic. But he doesn't stand alone. Behind him is the figure of Christ, supporting him on the journey to come. The man welcomes home a group of soldiers, seen in their uniforms, returning from the First World War. The Austro-Hungarian empire collapsed after WWI and the Slavic people were free of their reign. Young boys wave branches with bright green leaves, saluting the men returning from battle. Fully taking in the Slav Epic can take some time, but Uber is now all over Prague and jumping in a cab from the city centre to the National Gallery won't cost you much. The experience is absolutely worth it.